A funeral service for James Robert “Bob” Noyce, 92, will be held at 11:00 A.M. Thursday, April 11, 2019 at the Wheatland Bible Church in Wheatland, Wyoming with Pastor Jason Iacovetto officiating. Interment will be held in the Wheatland Cemetery with military honors accorded by Ora Call American Legion Post #10, Laramie Peak VFW Post 3558, and Army Honor Guard. 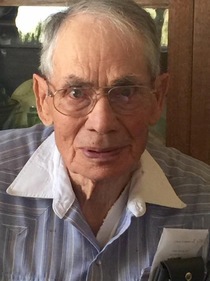 Bob Noyce, loving husband, father, grandfather, and friend passed away Thursday, April 4, 2019 at the Platte County Legacy Home in Wheatland. Bob was born September 10, 1926 in Wheatland, the son of Irvin Charles and Minnie E. (Green) Noyce, the middle of three children. In May 1945, Bob was drafted into the United States Army. He served his country during WW2 as a military police officer in Belgium, France, and Germany. After an honorable discharge, Bob attended LeTourneau Tech in Longview, Texas where he studied engineering. On December 25, 1951, Bob married the love of his life, Joyce Clipperton, daughter of Athelstan and Ellen Clipperton of Butterfield, Minnesota. Together, the pair raised two beautiful children, and operated Noyce’s Friendly Shop for more than 30 years. During that time, Bob also worked for D.W. Hopkins Construction as a heavy machinery operator, a corporate member with Lock Trucking, Inc., and as a mechanical engineer for Basin Electric until his retirement in 1992. Friends and family may call at the Wheatland Bible Church Fireside room, Thursday, from 9:00 A.M. to 10:30 A.M.